I love almost all genres of music, but Country is the clear favourite. There isn't much of a country music scene in the UK, so visiting Nashville has been on my bucket list for a very, very long time... and if you can't do something special for your 30th birthday when can you?? We rose bright an early on our fist morning in Nashville (very early in fact - thanks jet lag!) and didn't waist any time heading Downtown. 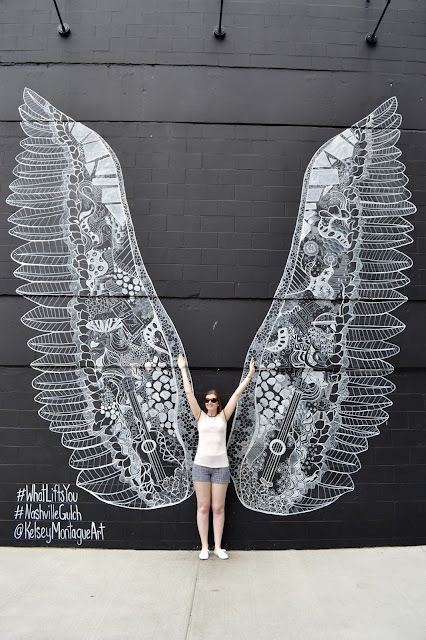 I have been following Kelsey Montague's art on Instagram for ages, and literally stumbled into her famous wings not long after we left the hotel. Why can't every city have bike stands in the shape of music notes?